One of the goals of Travertine Warehouse is to make your online shopping as pleasant and enjoyable as possible. We realize that not everyone looking for travertine, marble and other natural stone products are contractors or may have experience with choosing the right products, so we have developed some categories to help you with your search. We have grouped our products together by their use, which is a great way to be able to look at all your options including travertine and marble. There are some basic terms to consider to help you to find the right category of natural stone or products. Tiles – tiles are for indoor use, including for flooring, on walls, in bathrooms as well as other interior uses. Pavers – pavers are thicker than tiles and are used for outdoor applications including pool decks, patios, driveways and outdoor walkways. Pool coping – coping is the specialized, rounded, edging material, either marble or travertine, which is used to border the top of the pool and to separate the pool edge from the deck. 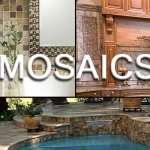 Mosaics – mosaics are smaller tiles preset on a 12X12 mesh for easy installation. They are often used on walls, backsplashes and shower or bath enclosures as well as interior floors. We also provide sealers and accessories, giving you everything you need for travertine, marble and natural stone care all in one easy to use location. For those who know just what they want, our search box is located on the top right-hand corner of the page. For help in ordering a sample, or to get more information on any of our products, don’t hesitate to give us a call at 1-866-852-6999.